The documentary “Tower” revisits the 1966 University of Texas massacre through animation and archival footage. 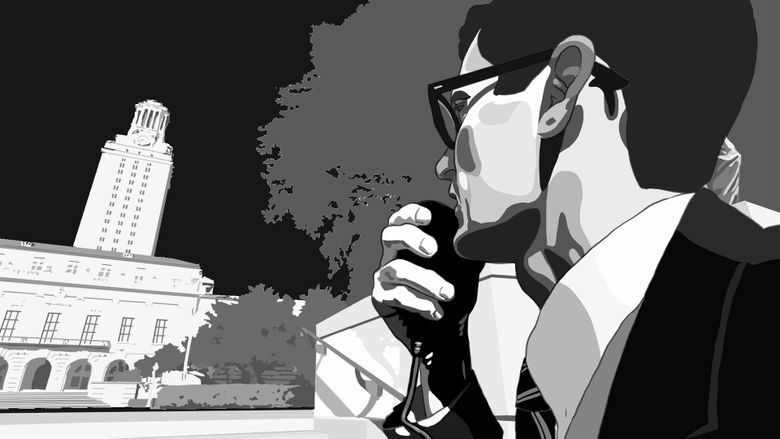 Movie review of “Tower”: Using newsreel footage, rotoscoped animation and talking-head interviews, this documentary re-creates the events surrounding the 1966 Texas Tower massacre with a remarkable you-are-there immediacy. Rating: 3.5 stars out of 4. Gunshots echo throughout “Tower.” So very many gunshots. As blast follows blast, 50 years vanish in clouds of gun smoke and a frenzy of panic, confusion, pain and, yes, bravery. Suddenly, it’s Aug. 1, 1966, and a madman has ascended to the top of the University of Texas Tower in Austin and is firing down onto the campus and neighborhood streets. In the space of 96 minutes, 14 people are dead, including the shooter and the unborn child of a pregnant woman who was shot but survived. Thirty-one are wounded. Later, it’s discovered the killer has murdered his mother and his wife before embarking on his rampage. Using a unique mix of newsreel footage, rotoscoped animation of actors re-enacting key events and on-camera contemporary talking-head interviews with survivors, police and eyewitnesses, filmmaker Keith Maitland has created a documentary with a remarkable you-are-there immediacy. ‘Tower,’ a documentary directed by Keith Maitland. 82 minutes. Not rated; for mature audiences (contains violence and disturbing images). Northwest Film Forum. The shooter, Charles Whitman, is not seen, other than a brief glimpse toward the end of the feet of his corpse. Maitland’s focus is on the people on the ground: a radio reporter relaying live coverage from his car that’s broadcast nationwide; a newspaper delivery boy shot off his bicycle; a pregnant student lying wounded and helpless on the sun-scorched campus plaza for an hour beside the body of her slain boyfriend. Courageous acts are shown: Of the police who, armed only with pistols and a shotgun — no Kevlared SWAT teams in those days — went to confront the killer. Of a woman who ran to the side of the wounded pregnant student and lay down beside her as the bullets flew to offer words of comfort and encouragement until rescue arrived. Of a student bystander who risked his life to pull her to safety. The interweaving of animation and nonanimated footage gives the picture a kind of surreal quality that befits the sense of the survivors of how unreal the event seemed to them. “What in the world has happened to my world?” one interviewee remembers thinking. As to the killer himself, the pregnant woman, who lost her baby in the shooting, says she forgives the man. At the end, a brief montage offers reminders of such recent mass shootings as Columbine and Virginia Tech. In 1966, the Tower massacre seemed an isolated aberration. Turns out it was only the beginning of a very dark chapter in America’s history.